1927, Breslau, Poland: Two elaborate and sadistic murders are discovered within days of each other. The body of an unknown musician, bound and gagged, is found behind a false wall in a shoemaker’s workshop. The victim had been sealed in alive. Elsewhere in the city, the horrifically mutilated body of a locksmith is found. Next to each victim is a torn-out calendar page, with the day of the death marked in blood. Nothing else seems to connect the cases. It falls to Criminal Councillor Eberhard Mock to solve the case, the mystery taking him still further into the Breslau underworld he knows only too well. Meanwhile, his hard-drinking nocturnal habits soon threaten his volatile marriage, and prompt some strange behavior from his wife … and before long, Mock and his team will be investigating not only two of the grisliest murders in the city’s history, but the councillor’s own wife. MAREK KRAJEWSKI was born in Wroclaw (formerly Breslau), Poland, on September 4, 1966. He is the author of five novels in the Breslau series, which have been translated into fourteen languages and won Poland’s top literary and crime prizes. Krajewski is a former lecturer in Classical Studies at the University of Wroclaw. 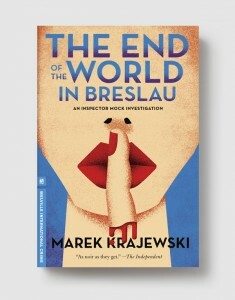 DANUSIA STOK is the translator of the previous title in the Inspector Mock series, Death in Breslau, as well as The Last Wish by Andrzej Sapkowsi.